B0881. John R. Bennett. 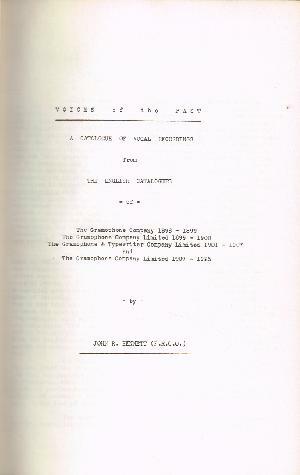 Voices of the Past, Vol.I  The English Catalogue, 1895-1925. Index; DJ. Lingfield, Oakwood Press, 1955. 285pp. Index; DJ in mylar. "John Reginald Bennett’s compendium, VOICES OF THE PAST, is a major reference to English, Italian, French, German, and Russian vocal recordings between 1898 and 1925. 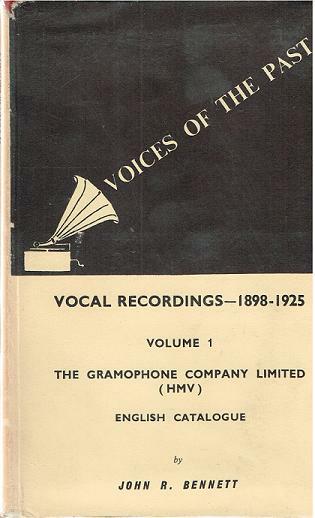 These volumes, encompassing more than 25,000 vocal recordings."